TeledyN: Have Blog - Will Travel: What does it mean to be human? A Review of the ?? ?What does it mean to be human???? 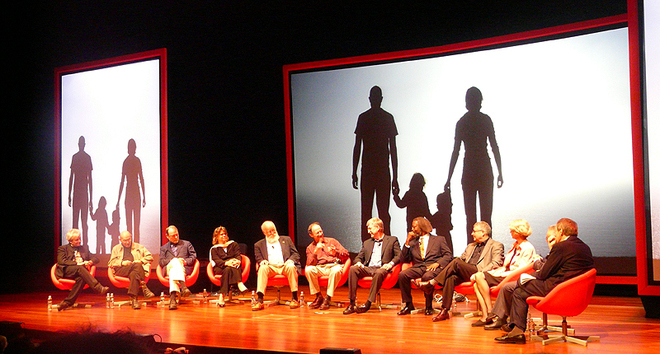 panel at the 2008 World Science Festivalt: 10 top scientists on a panel held at this year?? ?s World Science Festival in New York City, 10 answers to the question, 9 of them wrong. This is hilarious, really. Famous names all of them, darlings of the media and journals both, textbook authors and top educators, not one hesitant to answer with utter nonesense, and 9 of them without respect for pretty solid facts. The tenth only says he has high hopes for science being able to answer this question; on the output of this distinguished panel, one has to wonder about that.